Every so often, a controversy erupts over something that seems relatively simple: Namely, the concept of linking to (and thereby giving credit to) the source of a news report. In one of the most recent examples, Instapaper founder Marco Arment — who broke the news about a wave of corrupted apps in the Apple store — kept track of both media outlets that repeated the news and whether they gave credit to him or not. Some did but others didn’t, and some hid their links or otherwise tried to make it look like they broke the news themselves. There are a number of reasons why this kind of behavior is still so common a decade after digital media became mainstream, but none of them justify it. 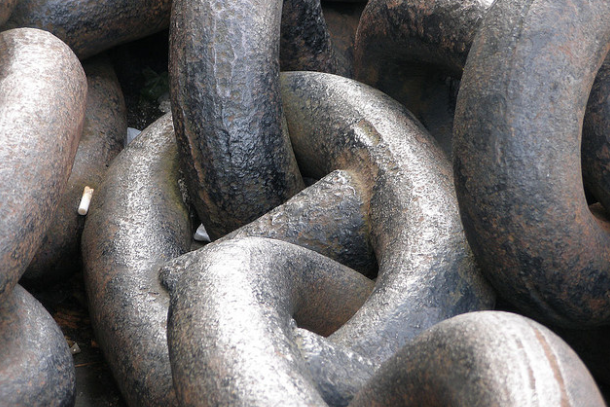 Simply put, linking is a core value of the web, and if we lose that then we have lost something incredibly important. Arment initially reported on Wednesday that corrupted apps downloaded from the Apple store were crashing repeatedly, something he noticed with his own Instapaper app first and then confirmed was a problem for close to 100 other apps. The news spread quickly throughout the tech blogosphere, but Arment noticed that many outlets were not giving him credit for breaking the news, so he started what he called “Rewrite Bingo” by cataloging the blogs that were duplicating his report. In some cases, blogs such as CNET gave credit to Arment for the initial report and linked to him prominently, while others linked to one of the first outlets that repeated his news, such as The Verge. Some linked to subsequent reports at other sites without any mention of Arment. And several reports that didn’t initially give credit to him were updated to add a link after the Instapaper founder started tweeting about the lack of credit. Both John Gruber of the Apple blog Daring Fireball and Alex Howard of O’Reilly Radar pulled together Storify collections of his Twitter stream. Virtually every blog or media outlet has probably seen similar kinds of behavior, and that includes GigaOM: Our legal expert Jeff Roberts broke a story on Thursday about a patent troll going after the popular travel site Hipmunk, and several outlets covered the same news without providing a link to our post on it. With other stories, including one recent one from Ki Mae Heussner about an Amazon acquisition, outlets such as the Wall Street Journal mentioned her report but failed to link. Although a link was added later after we complained, it shouldn’t take a complaint to get a media outlet to give credit to the original source of the news it is reporting. Links were and are the currency of the collaborative web, that started with blogs and since then has spread to everything from Twitter to Facebook to Tumblr. Links are the essence of the new remix culture. It is how you show that you respect someone’s work and efforts. It is also indicative that you are part of a community. In the days when newspapers ruled the world of information, giving credit to other outlets was (and often still is) discouraged. Rewriting or “matching” a story that someone else broke — or taking wire-service reports and rewriting them a little — was standard practice, and code words such as “one report” were often used so a newspaper wouldn’t have to mention a competitor’s news story. This kind of behavior has spilled over onto the web as more mainstream media outlets have moved online. One reason people often give for the failure to link (or the “hiding” of links at the bottom of an article, for which some have criticized outlets like The Verge) is that the financial model for digital media — that is, advertising — relies on page views, and one of the ways to juice those numbers is to pretend you broke a story. But regardless of whether this inflates reader numbers in the short term, it ultimately depreciates the value of the blog that does it, and that leads to a loss of trust. And trust is far more important than pretending you have a scoop, the half-life of which is now measured in minutes. But this isn’t just about the media. Despite skeptics like Nicholas Carr, who has argued links interrupt the flow of reading and confuse readers, linking of all kinds is one of the crucial underpinnings of the internet and the web. That’s why the attempt to criminalize links via lawsuits like the one the U.S. government has launched against website operator Richard O’Dwyer (who linked to copyright-infringing video streams), is such a dangerous phenomenon. Links are the lifeblood of the internet, and it is up to all of us to see that we keep them — and the collaborative nature of the web itself — alive. Thanks Joe! We are looking into making the color of the links more obvious on paidContent posts. This is truly hypocritical. GigaOm’s PaidContent also fails to provide links to sources. Check the references to the Scholarly Kitchen that appeared without links. It’s disturbing. Physician, heal thyself! Not sure what specific story you are talking about but there are two references to your site and on both the links and credits are properly given. One is a daily round-up of news and there is a link to your story. And there is another bigger piece and that actually starts with credit to you and your publication with the requisite link. I just reviewed this with the help of Laura Hazard Owen, who pointed out one of the links to me. I literally did not see this the first time, and would have missed it the second time had Laura not pointed this out to me. The text for the linked terms are indistinguishable from the text around it. Use a different color, perhaps? But in any event, my charge of hypocrisy was wrong. So now I am complaining about your graphic design. For any novice blogger like me, this is helpful. Thanks for the info. The only way links would interfere is if the page designer didn’t make good choices. In which case the entire page is liable to interfere. Unless you’re like me and you open every link into a new tab until the browser deletes itself to avoid the barrage. Despite the success of Facebook and mobile apps that attempt to extract value from walled gardens, I remain optimistic that the Web and behavior that rewards linking will continue to win. And I believe that the same open link and search model will win for work and serendipitous discovery in the realm of Enterprise 2.0 (or Social Business if you wish). Links do matter, but app culture is changing the structure, movement, and experience of what used to be the known as ‘the web’ for more and more people. In the new world of apps, digital experiences may be more discreetly monetizable and tightly controlled as products, but they also tend to be built like little islands â€” foregoing a lot of the flow and synergy of the web as we’ve come to know it. Web apps can still easily employ links because the web browser is a fantastically open platform. However, most phones and tablets push their own proprietary applications, making it difficult for the average user to reach content not presented inside a proprietary app. This is my least favorite aspect of the iPhone/iPad revolution; Many operating systems and developers alike have embraced a model that discourages the entire concept of moving between destinations in the digital world. Consumers vote with their money, and they should make themselves aware of the effects of the platforms they’re supporting. The last thing we need is the web equivalent of a cable company, with all digital culture feeding through a handful of gatekeepers. That’s a great point, Seth — mobile apps don’t handle links well (if at all) which is why web apps are better in many cases, at least when it comes to media. The web survives on the Give-n-take relationship. Those who fail to “give” credit loose credibility among consumer. Not good for long term. In next 5 yrs digital readers(and digital ad spending) will explode at an unprecedented pace. Totally agree, Anuj. Thanks for the comment. I liked a statement he mentioned in his article by former Irish President Mary Robinson. That goes so well with your article. I wish you were right Anuj, but I’m not sure that the consumer understands the giving credit part. Not sure consumers are as clueless as this. They may not understand what happens behind the scenes, but they have values and will for the most part choose their media based on trust which has always come from crediting sources. We’ve seen the cycle of closed and open ecosystems many times in the short digital era. Open and transparent always wins.